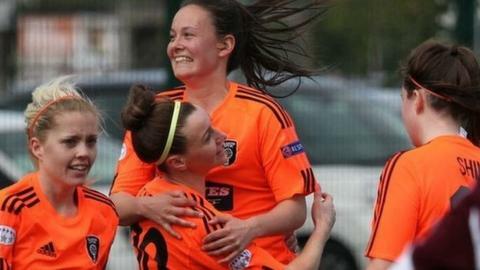 Glasgow City and Hibernian both won comprehensively in the Scottish Women's Premier League ahead of Wednesday's League Cup final at Ainslie Park. City warned up for the defence of the trophy with a 6-1 win over Hearts. Hibs were 4-0 winners away to fellow Edinburgh side Hutchison Vale. Elsewhere, Aberdeen and Rangers posted 3-1 wins against Inverness and Stirling University respectively, Celtic were 3-0 winners at Spartans and Hamilton Accies beat Forfar Farmington 1-0. Glasgow City head coach Eddie Wolecki Black said: "It was obviously a difficult day weather conditions wise but I thought we coped with the elements well. "It probably took their goal to spark us into life and I felt we responded pretty well and it was a comprehensive half-time lead. "After the break, the cup final starts to come into everyone's mind and it seems to be more about not picking up an injury ahead of Wednesday on the back of the players' minds and I can understand that. "We are still top of the table, we got the three points and scored six goals, so pretty happy with that."